Manchester City go into this match in 6th place with 10 points having picked up 3 victories, 2 defeats and a draw from their opening 6 premier league games. Last time out they lost 3-2 against Aston Villa at Villa Park despite taking the lead on a couple of occasions. This isn't the first time they've been pegged back, losing to Cardiff 3-2 earlier in the season. Although Manchester City are yet to win an away game in the Premier League with Pellegrini, they have a 100% home record with thumping wins over Manchester United and Newcastle along with a 2-0 win over Hull. The summer was no different than usual for the blue half of Manchester. They done their business early and expensively replacing Carlos Tevez and Balotelli who had left in January with Negredo and Jovetic amongst many others. 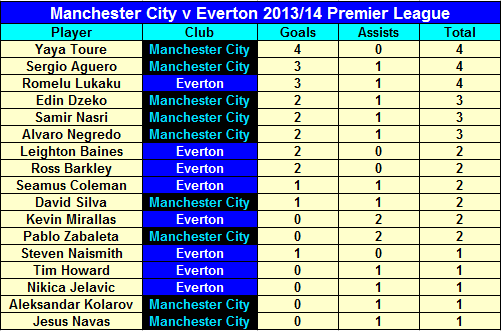 The above table excludes the loan signings of Scott Sinclair and of course Gareth Barry. Romelu lukaku grabbed the headlines on Monday night as he marked his Goodison bow with 2 goals in what finished a nervy 3-2 victory to Everton after a scintillating first half gave Everton a 3-0 lead at half time. Lukaku has been instrumental in his two premier league appearances for Everton so far scoring the winning goal in both. Steven Pienaar could return for the game this weekend after a spell out on the sidelines which may be necessary as Kevin Mirallas appeared to pick up a foot injury against Newcastle which may see him ruled out. Antolin Alcaraz suffered a set back in training and is still a few weeks away from fitness whilst Gareth Barry is ineligible to play against his parent club. This will be the 173rd meeting between the clubs. Everton drew last year's match at Eastlands 1-1 as Fellaini's goal was levelled out when Tevez converted a spot kick the former gave away. Me mars being a right slag and refusing to get BT. What's the best result for us tonight? Bayern Munich to thrash City or a closer more competitive game? Dont think it really matters. He rotates the squad quite a lot doesn't he? So it's not like if they're running around like headless chickens it'll probably impact the game much on Saturday...although we can hope. That said, the opposition losing is always better I feel...especially if it's psychologically speaking a bit of a kick in the nuts like a last minute goal to lose the game. Does getting fouled for a free kick which is subsequently scored not get you an assist (like Barkley x2 at WHam)? Yeah, Barkley got two assists for those. I'm not sure, I know they do in fantasy football but not sure if they do properly. Getting twatted by Bayern now. We could take advantage of their low confidence, or they could take their frustration out on us on Satdy and leather us. I'd say the latter is more likely. They're looking poor at the back though. They all look fucked mate given the right run around. We should take a high tempo to them early on. "Manchester City have been utterly outclassed - and some of their players have been ruthlessly exposed. Joe Hart has been dreadful, beaten again at his near post for Arjen Robben's goal and Gael Clichy is another having a nightmare. Bayern Munich are a magnificent side but this has been very lame from Manuel Pellegrini's team."